This Lewis N. Clark duffel's signature water-resistant WATERSHED™ material provides protection from the elements and the SPLASHGUARD™ base easily repels dirt and mud to keep your gear clean. The WATERLOCK™ weather flap prevents rain from seeping through the top so your belongings don't get soaked if you encounter a stormy day. Plus, the neoprene gear bag adds extra storage capabilities. This Lewis N. Clark duffel&apos;s signature water-resistant WATERSHED™ material provides protection from the elements and the SPLASHGUARD™ base easily repels dirt and mud to keep your gear clean. The WATERLOCK™ weather flap prevents rain from seeping through the top so your belongings don&apos;t get soaked if you encounter a stormy day. Plus, the neoprene gear bag adds extra storage capabilities. You can use it for your phone, sunglasses, sun block, insect repellent, or even a tablet. When you&apos;re done with the duffel, it easily folds down and can be stored in the gear bag. The large opening makes use of every cubic inch and provides easy access to gear so you don&apos;t have to move all your belongings around in order to find the item you&apos;re looking for. With a variety of options for carrying the duffel, such as dual webbed grab handles, reinforced main grab handles, and a shoulder strap with a SOFTTECH™ shoulder pad, you&apos;ll be able to get your gear from place to place effortlessly. 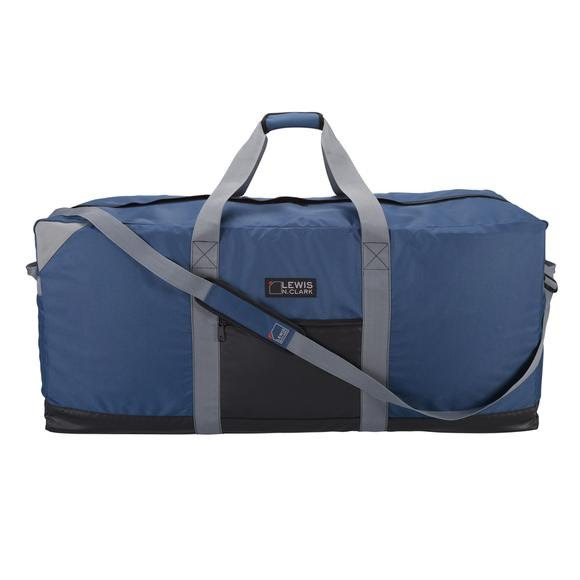 Keep your gear protected from the elements with this heavy-duty duffel bag. Dimensions 16" x 40" x 16"